HDB launches 7,214 flats for sale today under the November 2018 Build-To-Order (BTO) and Sale of Balance Flats (SBF) exercise. This comprises 3,802 BTO units and 3,412 SBF units across various towns/estates. A wide selection of flats, ranging from 2-room Flexi to Three-Generation (3Gen) flats, is offered in the Nov 2018 BTO exercise to meet the diverse housing needs of first-timers, second-timer families, multi-generation families, elderly and singles. The 3,802 BTO flats on offer are spread across five projects. Four projects from the HDB launches are in the non-mature towns of Sembawang, Sengkang, Tengah and Yishun, and another is in the mature town of Tampines. The BTO project in Tengah, Plantation Grove, is the first to be launched in the new Tengah Town. Located along the Forest Fringe in Plantation District – the first of five housing districts to be developed in Tengah – it will provide a tranquil and rustic environment for residents to enjoy flora and fauna at their doorstep. 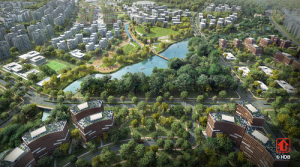 In keeping with the vision for Tengah as a “Forest Town”, it will be designed with green, sustainable and smart features, such as lush greenery, a myriad of community spaces, dedicated cycling paths, and smart lighting in the estate. Buyers of the BTO project in Tengah will also have the option of subscribing to a Centralised Cooling System (CCS), offered by SP Group in collaboration with HDB. The first to be piloted in an HDB estate, the CCS is a more energy-efficient cooling solution than conventional air-conditioning systems. Chilled water will be piped to homes from chillers installed on the rooftops of selected HDB blocks, so subscribers of the CCS will not need to install or maintain their own air-conditioner condenser units. In this sales exercise, HDB will offer the first batch of BTO flats with shorter waiting times in Sembawang, Sengkang and Yishun. Home buyers can expect to obtain the keys to their flats in about 2 to 3 years from the point of application. The flats with shorter waiting time will come with floor finishes, internal doors and sanitary fittings. This will reduce the renovation works required and enable home buyers to move into their new flats sooner. All units will also come with an open kitchen concept (i.e. no partition wall for kitchen) where the layout permits. With these provisions, flat buyers will no longer be required to make a selection under the Optional Component Scheme. First-timer families will enjoy higher priority when applying for these flats, with at least 95% of the 4-room and larger flats set aside for them. This is a 10% increase from the current quota of at least 85% in the non-mature estates. HDB said that its new flats are priced with a generous subsidy, taking into account factors such as location, flat attributes and prevailing market conditions. HDB’s prices are considerably lower than transacted prices of comparable resale flats in the vicinity. In addition, 2-room Flexi flats are priced taking into account the lease chosen. Eligible first-timer families can enjoy up to $80,000 of housing grants, comprising the Additional CPF Housing Grant (AHG) (up to $40,000) and the Special CPF Housing Grant (SHG) (up to $40,000). With these grants, flat buyers could pay as little as $21,000 for a 2-room Flexi flat, $90,000 for a 3-room flat, $191,000 for a 4-room flat, and $322,000 for a 5-room flat.